Each Bingo Set comes complete with a Masterboard, Slide Cards, and Bingo Playing Cards. 25 and 50 slide card sets are available. These bingo sets replace the need for a cage and markers. Easily transportable, these sets are ideal for small church groups, bus tours, and senior citizen groups. 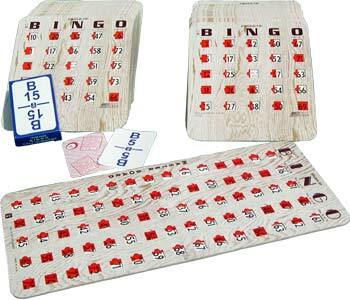 We offer dozens of Bingo Products that are availabe for immediate shipment. Check out our wide selection of Bingo Supplies including, Bingo Cages, Finger-Tip Slide Cards, Professional Bingo Balls, and many other Bingo Items. Get our FREE 104 Page Catalog for our complete line of Bingo Products through our secure online form, or contact us at 1-800-233-0828 to see if we carry other Bingo Supplies you need.